First line: "Breathing is a right not a privilege, so I'm stealing it back." 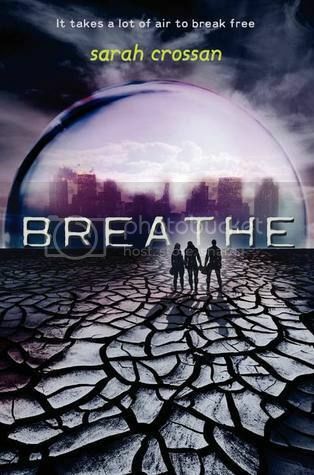 Alina, Quinn and Bea live in a world where oxygen is hard to come by. Many citizens live in safely protected domes, where oxygen is carefully controlled. The wealthy, known as Premiums, are able to afford more, of course, while poorer members of society known as Auxiliaries must move slowly and breathe cautiously in order not to run out. Alina is working with a group of rebels who are hoping to use plants outside the domes to increase oxygen in the air. At the very least, they want to break down some of the unfair class structure that is currently rigidly enforced. Bea is a lower class citizen. After she flunks the very challenging set of tests to be raised to a higher position, her parents are left to hope that she'll make a good marriage and raise the entire family's status so that they can all breathe easier. Wealthy Quinn is up for a bit of adventure and he readily agrees to a camping trip on the outside of the dome. The story features a love triangle between Alina, Bea and their love interest Quinn. Love triangles can frequently move a plot along with plenty of opportunity for conflict, but here, I just felt sorry for the two girls. Quinn is overcome by Alina's beauty, even though he's been best friends with Bea for ages. I enjoyed the alternating chapters format which pivots between the three main characters and their unique voices. The lack of oxygen is fairly well-thought out - exercise becomes a privilege for the wealthy who are able to afford to get their heart rate up. Poorer people age faster and tire easier in the oxygen poor environment. Fans of dystopian will find a lot to like here: an oppressive government, citizens who are kept in the dark about what is really going on, brave teens who are ready to challenge the status quo, a love triangle and some daring chase scenes.